Carol Hively, Director of Public Relations and Team Communications of the Space Foundation released this announcement regarding the selection of a candidate to head the Space Foundation Washington D.C. office. The Space Foundation has selected Col. Thomas Dorame, USA (Ret. ), as Vice President, Strategic Operations, at its Washington, D.C. office, effective September 4, 2018. Dorame joins the Space Foundation after serving more than 30 years in the U.S. Army. His last assignment was as the U.S. Army Legislative Affairs Principal Military Deputy, where he was responsible to the Secretary of the Army on congressional issues. He communicated, coordinated and synchronized Army policies, programs and legislative objectives with Congress. He also advised Army leadership on key congressional issues and on developing effective relationships with Congress. "Thomas' legislative affairs, strategic planning, program management and strategic communications skills are a welcome addition to our team and support the strategic expansion of our national presence," said Space Foundation Chief Executive Officer Thomas E. Zelibor. 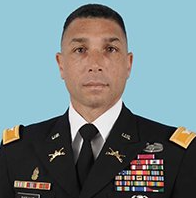 Prior to his role as the Deputy Chief of U.S. Army Legislative Affairs, Dorame was the Director of U.S. Army Future Force Initiatives (Force 2025). In this role, he was responsible for planning and harmonizing the multi-year effort as part of the Army's comprehensive strategy to develop emerging land-power concepts and capabilities, and innovative solutions to develop the future Army forces. He led the Army's strategic enterprise, which included Army agencies, organizations and industry partners, to orchestrate and integrate the Army's modernization efforts. Dorame is a graduate of the United States Military Academy and holds a bachelor's degree in economics and a master's degree in national security strategy from Georgetown University. He also has a master's degree in strategic studies from the United States Army War College. His awards and decorations include the three Legion of Merits, three Bronze Star Medals, two Defense Meritorious Service Medals, five Meritorious Service Medals and the Combat Action Badge. Through its Washington, D.C., office, the Space Foundation provides key administration and congressional officials and staff with educational information and testimony in support of civil, commercial and national security space policies.